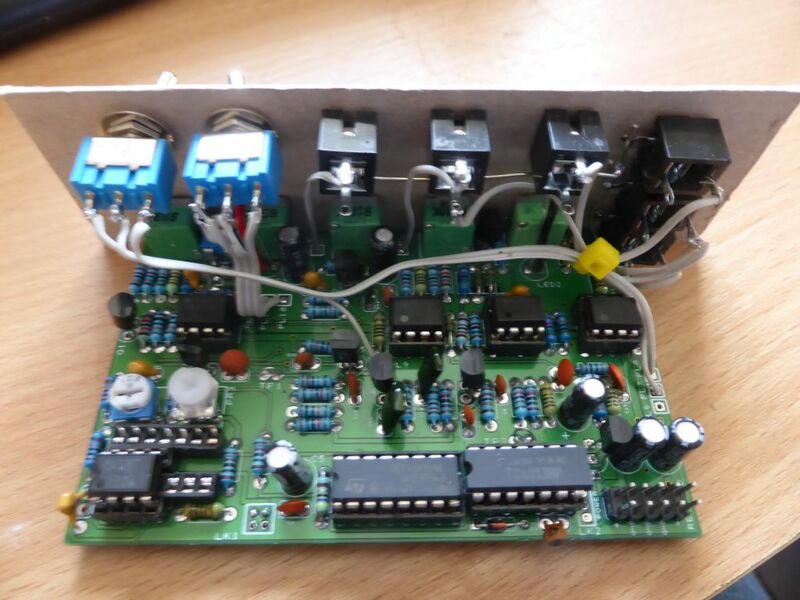 MUFF WIGGLER :: View topic - [order] 100m-ish Audio Delay (euro) - panels are in. [order] 100m-ish Audio Delay (euro) - panels are in. The latest in my range of 100m clones - the Audio Delay (BBD) from the M-172 module. This has been in the pipeline for some time, but I've finally got it working to my satisfaction. I've added an extra CV input, and the option to invert the resonance feedback path, plus a simple level/overload indicator. As the MN3004 BBD chip used in the original circuit is now rare, the PCB is designed to accommodate either an MN3004, or the much easier to obtain MN3007. The PCB should in theory also support various other MN30XX and MN32xx series BBD chips though only some of these options have been tested. The PCB is banana friendly, and can be easily converted to run on +/- 15V. - extreme delay flange incl. aliasing effects (normally you would adjust the delay range so that you can't get any aliasing from the front panel delay control). 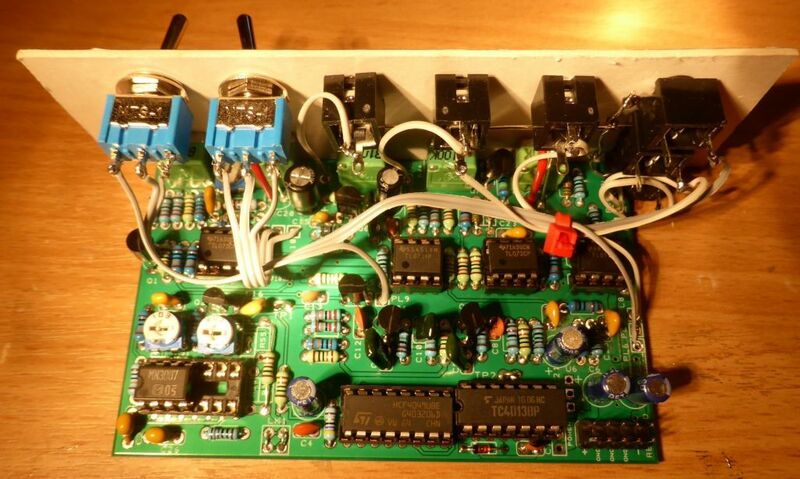 Did you have a look at the bbd stompbox circuits by madbean? These also have jumpers for mn30xx and mn32xx bbd ic's. Nice! 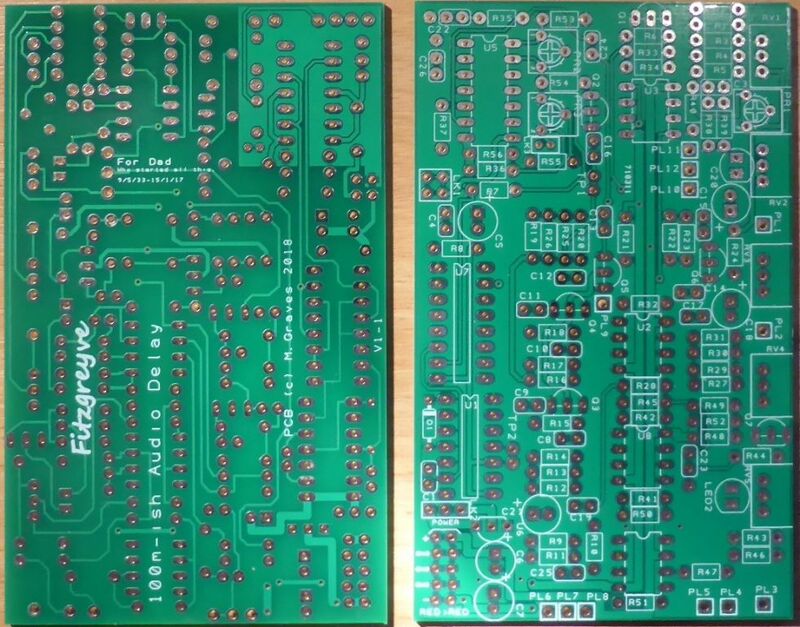 Interested in 2 pcbs over here. No, but I've used a similar approach. The Roland 100m circuit drives Vgg off the input bias voltage (not Vddd), so I've had to allow the option of the "standard" Vgg voltage divider as well for MN32xx chips. I'm up for one pcb! I would be interested in one board. It is to late in the process to ask for some kind of mounting hole or something else to help with mounting in another format than eurorack, I presume? Sorry, the current PCB run doesn't include any fixings other than via the potentiometers. If not eurorack, you could mount some of the potentiometers on the PCB, and some off the PCB to get a wider control spacing on your panel if needed ? The PCB is fairly packed, and I don't want to make it any deeper for euro use (it's currently 62mm deep). I'd be in for a panel and pcb. I am also interested in a panel/pcb set. I would be interested in a PCB/Panel set too when this delay comes to life. I’m interested in pcb and panel! Interested for one PCB and panel . Can I get an actual echo out of this circuit? Or is it for chorus/flange effects? Too few BBD stages for echo? As designed, it's chorus /flange as originally Roland used a 512 stage BBD. MY PCB should (in theory!) also be able to also take a 4096 stage BBD (MN3005 - not cheap, not tested) which should give a delay of about 56mS, but still not long enough for echo. Most BBD echo/reverb I've seen tend to use lower clock frequencies (10kHz or lower) to get longer delay, but with matching in/out filters (3Khz or so). I'll be contacting those who want only PCBs shortly, the order for panels will be going in after the christmas break. The build document will be updated in the next few days (it is christmas!). If anyone is (at least initially) considering building this using a BBD other than MN3004 or MN3007, please let me know and I'll try and prioritise that in the build document.